Excitement reigned supreme in Amorka town, a border community betwern Anambra and Imo States, when it’s sons and daughters gathered to celebrate their annual New Yam Festival. The traditional ruler of the community Igwe K.O Obiriolemgbe, who was accompanied by prominent traditional rulers from Anambra State to his palace to kickstart the event, wore a long sparkling gold attire, while his cabinet members wore bright red clothes. Top government functionaries, political gladiators, indigenes of the community, friends and well wishers attended the event. 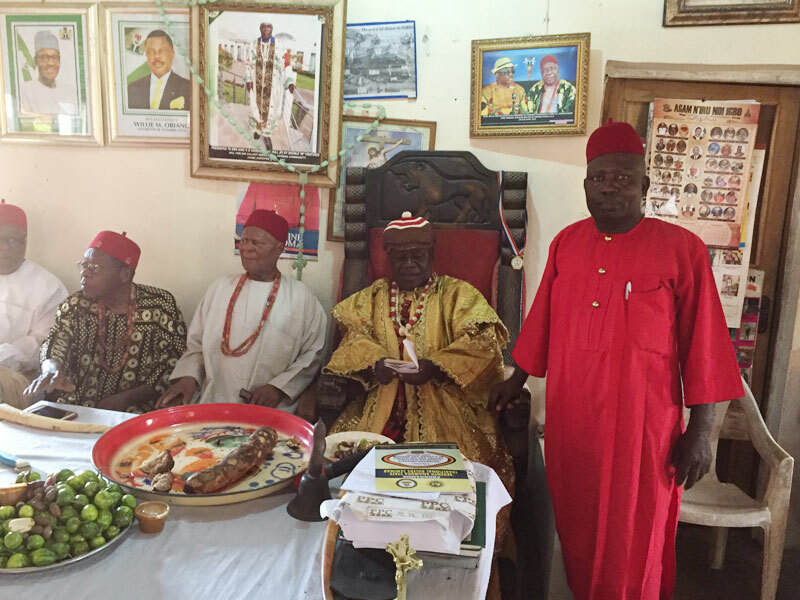 Some of the traditional rulers at the event were Igwe of Nnewi, HRH Igwe Keneth Orizu; Chairman Anambra South Traditional Rulers Council, Igwe Dr Dan Udoji of Oraifite; Igwe of Isekke, HRH Emmanuel Nnabuife and Igwe Benneth Emeka of Umueri. Others at new yam festival of Igwe Obiriolemgbe, who is also the Deputy Chairman Anambra South Traditional Rulers Council and the Chairman Ihiala Traditional Rulers Council were member, Anambra State House of Assembly, Hon Chidi Udemadu; Chairman Ihiala Local Government Area, Chief Ifeanyi Odimegwu; All Progressives Grand Alliance House of Representatives candidate in 2015, Chudy Ifeanyi Momah and CEO Krisdozzy Nig Limited, Christian Ogbue, among others. The New Yam Festival is an annual cultural festival celebrated by the Amorka people at the end of the rainy season. The celebration is popularly known as Iwa ji festival and is also celebrated in other West Africa countries and beyond. At the beginning of the festival, the yams are offered to the gods and ancestors first, before distributing the yams to the people. The ritual is performed either by the king of the community or by the oldest man in the community. This celebration is an important event in the calendar of Igbo people all over the world, as the festival is an epitome of the people’s religious belief. This year’s New Yam festival was no different as it was a highly captivating event. Prior to the event, the monarch in a statement made available to journalists had disclosed that the people of Anambra South would witness another exciting moment as Amorka Town celebrates its New Yam Festival. According to him, “Iri-ji is an annual event that we observe to promote the culture and tradition of the igbos. It brings us together as a community to celebrate and also brainstorm on way forward of our community.